Join our Chat Room. It's free. To win at online stock trading you need an edge...that one more bit of market information that nobody else is seeing. Legendary traders like WD Gann and JM Hurst had an edge. They had a huge edge. Why? Because they took the unbeaten path. Because while everybody in the crowd was asking the same questions and looking for the same answers they created their own way of seeing how financial markets really work. If you are searching for ideas to achieve financial freedom perhaps the answers are here. We can't lay claim to any of the vision of these Trading Masters. What we have done is extract those kernels of special knowledge that made super traders, and we explain how to use them...today...and people tell us that we do that better than anybody else. Your trading assistant tells you when swing tops and bottoms will end in any time frame, and which side of the market you should be on. This like magic trading technique is so easy to use in almost any trading platform that some people call it ethical cheating. We recommend our JM Hurst ebook to every stock, commodities or forex trader regardless of their primary method of technical analysis. Why? Because it's so easy, so objective, and sometimes so dead-nuts accurate at nailing swing tops and bottoms that after one week of trading you'd pay us almost anything to not give it back. Go to the JM Hurst Cycle Trading Directory. Elliott Wave International is one of the world's largest providers of market research and technical analysis. Their staff of full-time analysts provides global market analysis via electronic on-line services to institutional investors 24 hours a day. EWI also provides free tutorials, educational services including video tapes, on demand-on line training courses , special reports and books . EWI offers coverage for U.S., international, and futures markets for almost every time frame. Their publications are packed with labeled charts and expert analysis. Their educational products are wonderful tools that will help you learn Elliott Wave Theory and apply it in your trading. Go to the Elliott Wave Directory where you will find links to the Elliott Wave Oscillator and our very own Elliott Wave Trading Guidelines. MarketClub is a fabulous trader's resource. Go to school with the best known professional traders in the world. 35 audio and video seminars and PDF workbooks in Trade School cover forex, futures trading, day trading, money management, stocks, psychology, indexes, options, and more. Learn from the pros while saving thousands in seminar costs. Smart Scan and Triangle Trading technology helps you quickly find winning trades in stocks, futures, mutual funds, precious metals and foreign exchange. Smart Scan is more sophisticated than what most hedge funds use. Try it out with a Free Trend Analysis for any symbol of your choice. 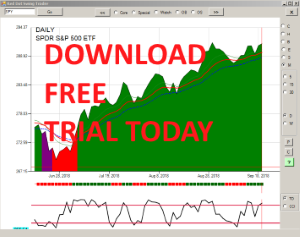 Portfolio management, active Traders' BLOG, historical intraday downloads, and superlative Streaming Charts. MarketClub is irresistible. Follow us on Twitter for trading resources. Videos, articles, books, courses, seminars.